RMS Titanic: Second Officer David Blair OBE. 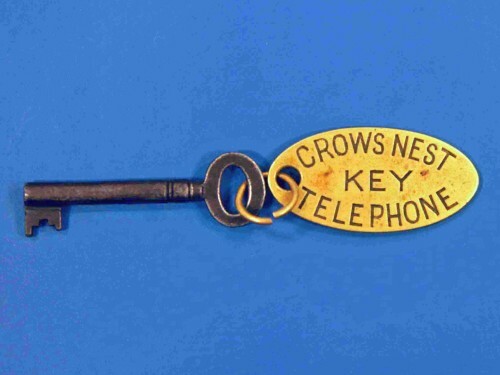 Iron key with brass oval tag attached "Crows Nest Telephone Key". Research by Henry Aldridge and Son, and eminent Titanic historians has established that the key was either to the portable Graham Navy Type telephone, used on the crows nest, or the binoculars locker also on the crows nest, mentioned by lookout, Fleet, in his official enquiry evidence. Lookout George Hogg, in his evidence mentions taking the key from Mr Blair and locking up the binoculars in Mr Blair's cabin, as would have been the practice whilst the ship was in dock and returning the key via the quartermaster. The key has been established to be of a british make for a 4 lever dead lock, as may be used on a secure locker or cupboard.